OM-ES-511 (1 serial port) and OM-ES-522 (2 serial ports) are software selectable as RS232, RS422/485 full duplex or RS422 half duplex and have removable screw terminals blocks for easy wiring, a slim ‘end on’ case and integral DIN rail mount. OM-ES-511 and OM-ES-522 have an operating temperature range of -30 to 80°C (-22 to 176°F) and with 5 to 30 Vdc dual input reverse polarity protected power supply making them perfect for industrial applications. Data transfer rates up to 1,000,000 baud, coupled with 1Mbit/s line drivers deliver uncompromising performance. 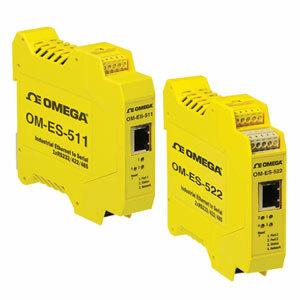 OM-ES-511 and OM-ES-522 provide simple instant networked serial ports in demanding environments. Serial Port Tunneling allows serial cable replacement over any distance, no software required. Suitable to be wired into existing power and network infrastructure or can be used with a separate power supply. Users of the Windows® Operating System Our software drivers give you local COM ports, allowing you to retain your existing software applications and connect to your devices over the network. COM Port can be assigned from COM 1 to COM 255 and the ethernet to serial device remembers your COM port assignment on reboots. Web Interface Users (Linux®/Android) A web interface allows secure configuration and control of the serial ports over a local network or the internet using any browser. You can access the device via TCP/ IP sockets from any networked device like a tablet for Android, PC or phone. OM-ES-511 and OM-ES-522 Factory Floor Applications Factory floors can be harsh environments. Extreme temperatures can be generated in the manufacturing process, machinery can be noisy and dangerous and space is a premium. However engineers still need to be able to access and maintain equipment safely and without downtime. As factories expand and modernize older equipment and remote devices need to be networked, but cabling can be expensive and impractical, especially over larger areas. Once your serial equipment is connected to a OM-ES-511 or OM-ES-522 Ethernet to Serial device you have the option of accessing it over a local network or connecting it to the internet. The devices can be fitted in areas where it would be dangerous for workers to monitor while the factory line is in operation. Manufacturing process and performance across a large site can be monitored and potential faults detected before they cause serious downtime costs. Use two devices back to back for serial tunnelling over Ethernet, for when you need to extend the reach of your serial cables. RS422 Standard: RS422 allows one transmitter and up to 10 receivers with data transmitter rates up to 10 megabits per second for distances up to 40 feet and up to 100 Kilobits per second for distances up to 1219 m (4000'). To achieve good long distance noise immunity, 2 wires are used to carry each signal, configured as a twisted pair of cables. The TXD pair and RXD pair are used to carry the data while the RTS pair and CTS pair lines are used for handshaking. Thus 2 twisted pairs are used without handshaking and 4 twisted pair cable is used with handshaking both these schemes allow full duplex data communications. RS485 Standard: RS485, based on the RS422 standard allows up to 32 driver/receivers pairs on a standard load or 128 low load devices per port can be connected. While only one of these should be transmitting data at any time, the rest can all simultaneously listen to the data. Handshaking is performed by software protocol. Two twisted pairs form a full duplex system. Often only one twisted pair cable is used as the TXD and RXD lines are tied together; this is known as half duplex mode. OM-ES-511 and OM-ES-522 implement a state of the art hardware autogating circuit ensuring error free communications in half duplex configurations. Industrial Ethernet to Serial RS485: Receivers are 1/8th load allowing up to 256 nodes on the bus. Fail safe open circuit and short circuit protection, protects the Industrial ethernet to serial device server against wiring faults.